Check out our DVD collection! Looking for something to watch this weekend? The library has more than 3,500 DVDs to choose from, including Academy Award winners, new releases, cult classics, foreign films, as well as many other categories. If you have suggestions for DVDs we should purchase, please let us know! And if you’re a fan of grainy VHS tapes, we still have over 2,000 of those. During the summer we divided the two collections so that DVDs and VHS tapes are no longer intermingled. Both collections are next to each other on the 2nd floor of the library, close to the top of the stairs. Searching HopeCat is the best way to find out if we own any particular title. You can even do searches such as “show me a list of all the Japanese language films in the library.” Stop by the Research Help Desk and we’ll show you how. Over the past few years we have been replacing VHS tapes that were still being used with their DVD version, if available. Many older tapes have not been released on DVD so we cannot replace everything. If there is a VHS tape you are interested in having available on DVD, please contact Dave O’Brien (obriend@hope.edu). Posted on September 9, 2016 September 12, 2016 Author David O'BrienCategories Library HighlightsLeave a comment on Check out our DVD collection! This summer, the task of grouping bound journals together on each floor continues with the lower level. 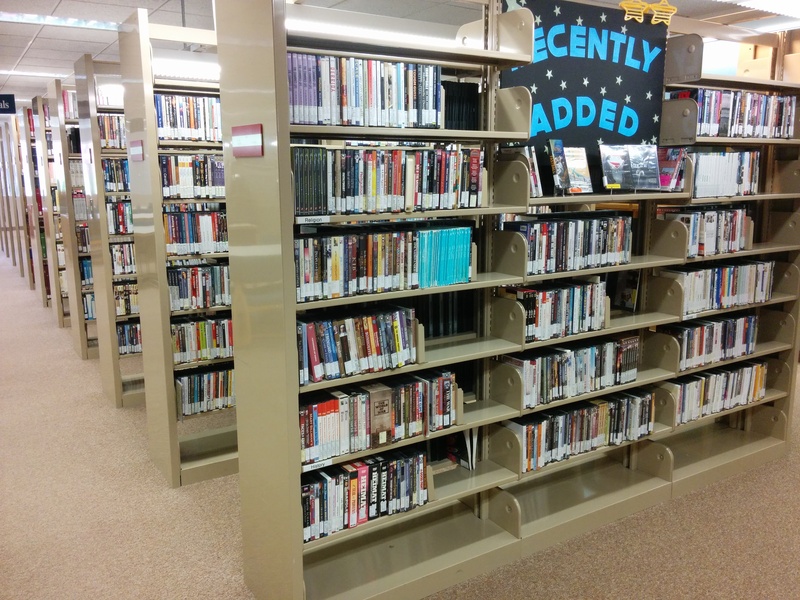 When complete, bound journals will all be shelved at the south end of the floor. The main staircase will be the approximate dividing line between journals and books. The books will be shelved with the “P” call numbers beginning just to the right as you exit the main stairwell and head north. Browsing the print books will be easier since they will not have large runs of bound journals interspersed amongst them. This process has already been completed on the second and third floors. The fourth floor journals will be separated from the books and shelved at the south end of the fourth floor at a later date. Rearranging the entire floor is like a giant jigsaw puzzle. While this process is proceeding, the books on the lower level are being kept on tables, in study rooms, on the floor, and in just about any random space we can find. If you want a book during this time we will be happy to go find it for you. In HopeCat you can click the Place a Hold link at the top of the record and we will retrieve the book for you, bring it to the circulation desk, and e-mail you when it is available. We hope to be finished with the entire project by early July. Want to brush up on your foreign language skills? 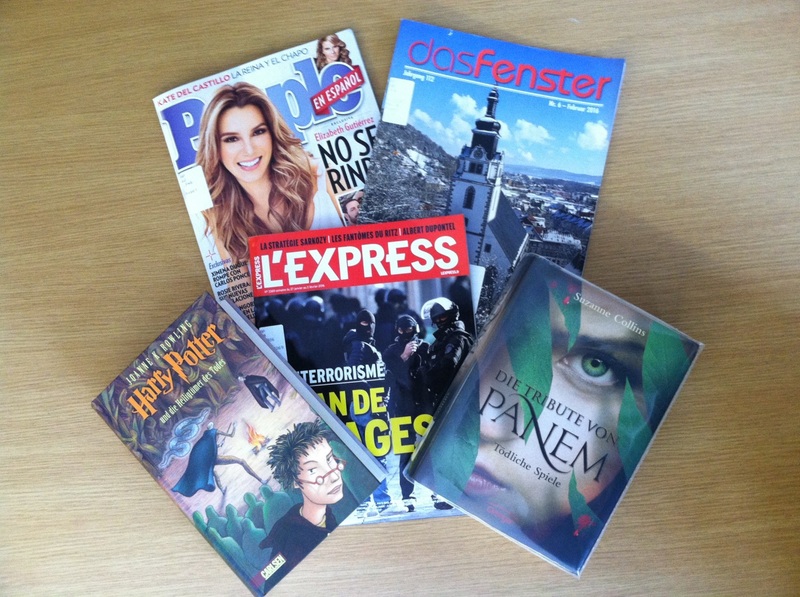 The library subscribes to several popular foreign language magazines. Among them are People en Espańol (Spanish), das Fenster (German), and L’Express (French). They are available on the library’s current periodical shelves at the north end of the first floor. We also have many foreign language books, including recently purchased German editions of the Harry Potter and Hunger Games series. To find other foreign language books and videos you can limit your searches in the library catalog by choosing the Advanced Search. Please stop by the Research Help desk or meet with a librarian if you want to learn more about searching HopeCat. Posted on February 11, 2016 Author David O'BrienCategories Library HighlightsTags Books, Foreign Language, French, German, Harry Potter, Hunger Games, Journals, Magazine, New Titles, Periodicals, SpanishLeave a comment on ¡Hola! Guten Tag! Bonjour! As the summer winds down, our projects are finishing up. There have been quite a few changes in the library from top to bottom. Starting at the top, the 4th floor had many older, unused books withdrawn from the collection. This finished a project that began on the lower level 4 years ago. The 3rd floor has been reconfigured so that the call numbers begin as soon as you exit from the main stairwell. Education materials (call numbers beginning with the letter L) have been moved to the 3rd floor from the 2nd floor. Also on the 3rd floor, all of the bound journals have been separated out of the main collection and are now shelved together at the south end of the building. Moving down to the 2nd floor, the video/DVD collection has been moved from the northeast corner to the shelves vacated when the Education materials went upstairs. You can now find DVDs just west of the main stairs. As on the 3rd floor, the bound journals on the 2nd floor are now shelved together, separate from the books. These are located directly after the new video/DVD section. The main floor remained relatively unscathed this year. The lower level has been completely re-carpeted. A few splashes of new paint have also helped spruce up the lower level. All in all, it’s been a busy summer with lots of changes. Please ask if you need help finding anything! Summer is traditionally when the library puts aside the typical day-to-day functions and works on major projects that would be too disruptive during the academic year. This summer is no exception, with several projects in the works. The final phase of our Sustainable Collections project is under way on the 4th floor. We are withdrawing older, unused, and readily available books from the collection. The affected subjects (with the dates they will be withdrawn) are: Philosophy (May 22); Psychology (May 22); Fine Arts (May 29); Religion (June 19); World History (July 10). Faculty may come to the library and indicate which books should be kept; or they can view the withdrawal lists online, highlight the titles to be kept, and e-mail those lists to Dave O’Brien (obriend@hope.edu). Finally, new carpeting will be installed on the lower level. 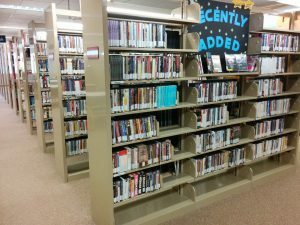 Beginning in mid-June student workers will be removing all books from the bottom shelves then lifting up the bases of all shelving ranges. Carpet installers will then remove the existing carpeting and install the new carpet. This project will take most of July. Minor painting will also occur on the lower level. The library now offers a service where we will retrieve the items you want to check out and hold them for you at the Circulation Desk. When searching HopeCat, simply click the Place a Hold link just above the search bar. If the item is currently checked out, you will be notified when it is returned. If the item is available, we will go get it for you. If you are not already logged in to your library account, the system will prompt you to log in using your 1.Hope username and password. (Guest users can use their library barcode and PIN.) By the following afternoon, items you have requested will be at the Main Circulation Desk. * You will receive an e-mail when the items are ready to be picked up, and you then have 5 days to come get them. You may request anything that can be checked out, including (but not limited to) books, DVDs, CDs, and music scores. You may also request items from Western Theological Seminary’s library. The process is the same, but you pick up those items at the WTS library Circulation Desk. *We are currently retrieving items only during weekdays. If you request an item on Friday it will not be available for pick-up until Monday. As always, wait for the e-mail notification that the item is ready and waiting.